Excuse the silence. Very busy. Back soon. Until then, this is my entry for this week’s Daily Ritual event on Flickr. Weeding. As pretty as they are, plucking dandelions out of my garden is a daily event just now. Your photos are amazing – do you never think of selling them? In addition to your blog being titled “A Wee Bit of Cooking”, you must be a wee slip of a thing yourself. 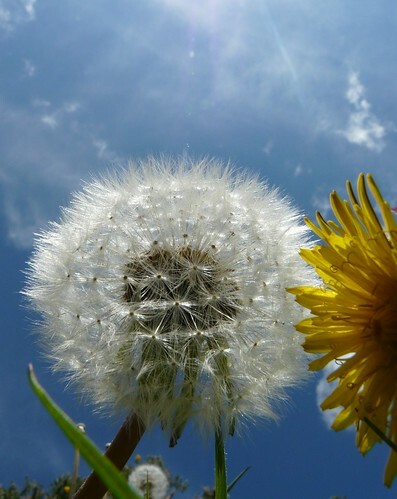 Otherwise, how could you have ever captured that amazing point of view for the dandelion photograph!!! Do you do something with the dandelion leaves or yellow blossoms? I’ve got dandelions as well in my garden – have used young leaves for salads and am thinking of using the yellow blossoms for a tea loaf or muffins.. Still undecided, you see. Looking lovely! You are totally welcome to come plucking dandelions in my garden too! Rebecca – I haven’t, no. There’s a little craft shop along the road from me, perhaps I should see if they are interested… Thanks for the kick up the bum! Pille – I’ve put them in salads fairly often but that’s about it. Should really experiment. Not with the ones in my garden though – never know where Marco has pee-ed! Beautiful picture. It’s so very happy. Wendy I have loads of dandelions as well. Everywhere and I hate them. They all blow in from the woods etc and make a complete mess of the garden. Lovely picture of a garden pest.